Sprouts For Hair - Say No To Hair Loss & Gray Hair Forever ! All women dream of long, luscious hair, don’t we? But the market is filled with cosmetics only to confuse us and of course, lead to us adding all the chemicals to our scalp. And little do we realise that healthy hair is a result of not just a good shampoo or a conditioner, but also a healthy diet. Apart from fruits, vegetable, nuts, and milk, there is one more very important food that needs to be part of everyday diet. Wondering what? It is nothing other than the very humble sprouts! Yes, you read that right. Loaded with fibre, minerals and other nutrients, sprouts have proven to significantly improve the rate of hair growth. Here’s why you must start binging on this beauty food! Sprouts boost the body metabolism and this, in turn, removes the free radicals and dead cells from the scalp. In addition, sprouts are also rich in proteins and vitamins, which play a critical role in hair growth. It turns out that not just eating a bowl of sprouts but also applying a thick paste onto your scalp causes capillary reactions in follicles which keep the pores of your hair strong. This way the hair gets stronger and the growth is enhanced. Improper maintenance of the hair roots leads to the unhealthy scalp, thereby becoming a breeding ground for fungus. The fungus in the scalp is called Malassezia, and this is also found to be the cause of dandruff. Although this might not affect you as much as a fungus caused on the skin, dandruff causes the scalp to become flaky, itchy, eventually removing the follicles. Eating a bowl of sprouts every day will restore proper nutrients to your hair, making it soft and luscious. Minerals are not just required for the proper functioning of your body parts. Your hair needs them too, in fact, a little more! The minerals locked up in sprouts cure a whole lot of hair issues. Here are some minerals eating a bowl of sprouts will give you! Vitamin A is known to be the supplement for many initial hair problems. The Vitamin A content in sprouts help to get rid of dryness in the follicles and the scalp, thereby boosting hair growth. Vitamin K is yet another important vitamin, required for protein generation and to dissolve the fats in the body. This activity of vitamin K keeps the hair roots stronger because of protein. Biotin or Vitamin B7 locks in the moisture content and is responsible for long, luscious hair. Sprouts need no special mention for its containment of these vitamins. Little did we realise the importance of iron when our mums and grandmoms forced that bowl of pomegranates on us. However, iron is specifically responsible to maintain good hemoglobin levels in the body. That aside, proper iron content in the body, particularly on the scalp, creates the healthy presence of oxygen, which makes the hair roots and strands stay hydrated. High amount of iron in sprouts benefits hair a lot. Zinc, essentially known for cell replenishment in the body, helps to keep the hair follicles and strands hydrated by activating sebum in the skin glands. Hair is no special to escape the attack of toxins. Premature graying and dead cells accumulation are some of the signs that your hair has undergone some terrific damage. And the only thing that can cure this is antioxidants. But, worry not! Eating sprouts will solve this too. There is a high possibility for the antioxidants that make the benefits of sprouts wider with strengthening and taking care of hair health. Apart from this, the omega 3 fatty acids protect the hair from split ends and brittleness. The benefits of sprouts due to healthy fats is enormous as it can give many health benefits in other regards. Vitamins and minerals aside, sprouts also ensure a good supply of silica to the hair. 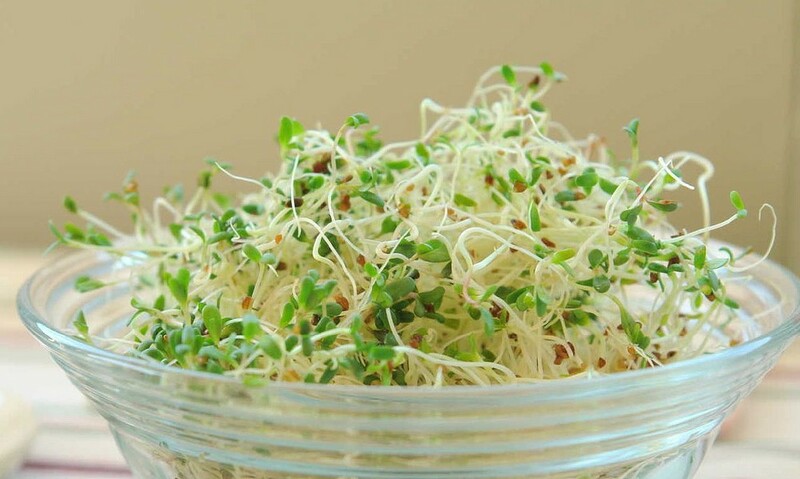 The silica present in some sprouts like alfalfa slows hair loss and prevents baldness. Silica helps to stimulate healthier hair growth and strength, and possibly contribute to re-growth of your hair. This might sound boring and dry, but salads have more than one benefit for your body. And adding more greens to your salad only means more good. So, don’t hesitate to throw in some sprouts to your salad. 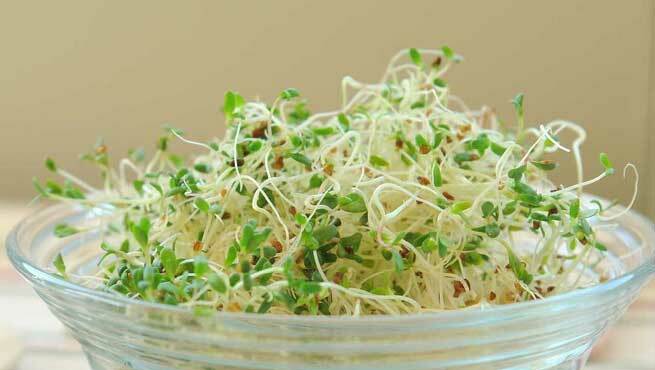 You could try alfalfa sprouts if you like a nutty flavor, radish sprouts if you like a dash of spice or green leaf sprouts if you like a subtle flavor. So, that’s crunch and nutrition in one go! You might be adding veggies, cheese, herbs and a whole lot of other stuffing to your omelet, but did you know you could make way for sprouts too? Yes, make an egg white omelet with sprouts for a savoury meal. You are sure to enjoy the goodness along with the taste! Have a variety of sprouts in your dinner salad or stir fry with other vegetables. Having sprouts in the evening will ensure a light meal. You would have heard of pancakes with maple syrup or bananas, but how about a healthy twist to the good old version? Pack in your pancake mix with alfalfa sprouts, herbs, and veggies and enjoy a wholesome meal. Needless to say, sprouts taste the best when packed in between two slices of bread. Add your favorite topping, veggies and you are sure to make this part of your everyday sandwich.